Everyone knows that a party doesn’t truly get started until the tequila starts flowing. There’s nothing quite like the sweet burn from your favorite tequila after licking up some salt and then washing it all down with a nice tart bite out of a freshly cut lime. Become the life of the party when you walk in dressed up as the biggest bottle of tequila anyone has ever seen! While everyone may have a horror story or two about ghouls and supernatural experiences, with this costume, you’ll easily change the subject. Just about everybody has an anecdote that gets to the point where this statement is uttered, “So then we broke out the tequila…” and you can be sure that hilarity is soon to follow. 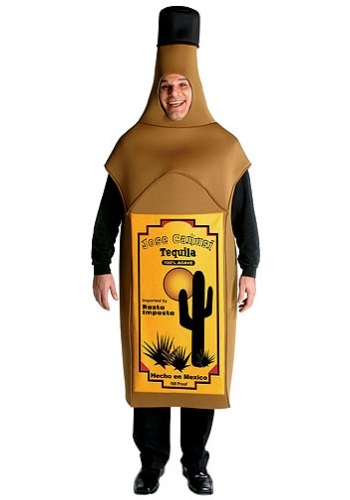 This funny Tequila Bottle Costume will lighten up the mood of any Halloween party. It will remind everybody to grab life by the bottle and live in the moment from time to time. Did you know that tequila is the only type of alcohol that's NOT a depressant? It’s a stimulant that's made only in Mexico from the blue agave plant. Also, another fun fact about tequila is that normally a worm is not resting at the bottom of the bottle, as many people are lead to believe! Study up on a few more facts about this type of booze and have a blast educating everyone at the next party you attend. Be the bottle that nobody regrets partying with this Halloween when you lighten the mood and further people's knowledge after slipping on this tequila tunic!